Saturday's Indy Star had public notices of the 2011 budget hearings for some of Marion County's smallest towns, and today's Star has notice of the City-County budget hearing and the Washington Township budget. Spring Hill Town estimates a 2011 budget of $30,280 and no property tax levy, unchanged from the levy this year. The Town Council will hold a public hearing on the budget on September 8 at 7 pm at 4488 Braedonwood. They expect to vote on the budget on September 22. The Town of Meridian Hills estimates a maximum total budget of $323,851 in 2011, with a maximum of $192,476 obtained through property taxes, up from $185,839 this year. They will hold a hearing on September 2 at 8:30 am at the First Congregational Church, 7171 N. Pennsylvania. They expect to vote on the budget at their October 21 meeting. Wynnedale Town estimates a total 2011 budget of $30,450, with a $12,000 property tax levy, up from $10,619 this year. They will hold their public hearing on October 13 at 7:00 pm at 2134 Wynnedale Road. A vote will be taken on October 27. The City-County has notice of three budgets - due to the arcane way our government is constructed. For the Consolidated City of Indianapolis, they estimate a maximum total budget of $754,720,024, with a maximum property tax levy of $205,008,659, up from $179,819,841 this year. For the money needed to be raised to pay debt only, they estimate a total budget of $108,231,121, with none of these funds to be raised through property taxes, which is unchanged from this year. They also note that they expect to incur a TIF replacement levy of $8,000,000 (not sure what that is, but if you know, please fill us all in). For the County budget, they estimate a maximum total of $303,736,465, with a maximum property tax levy of $136,682,237, up from $130,375,357 this year. The full City-County Council will hold a public hearing on these budgets on September 20 at 7:00 in the Public Assembly Room of the City-County Council. the Committees will go into details on sections of the budget from this week and on into October. The full Council expects to vote on the budget at its October 25 meeting. Washington Township government has notice of an estimated 2011 maximum budget of $2,067,700, with a maximum of $585,000 to be raised from property taxes, down from $700,060 this year. the Board will hold a public hearing on October 5 at 6:00 pm at 5302 N. Keystone Avenue. They expect to vote on the budget at their October 19 meeting. The City-County Council's Municipal Corporations committee will undertake a non-binding review of the small Towns and Township budgets at their September 28 meeting, which begins at 5:30 pm in room 260. The full Council will take a non-binding vote on these budgets at their October 25 meeting. Amy Hillenburg, editor and reporter at the Mooresville-Decatur Times, has a piece in Saturday's edition entitled "Resident wonders whose land is it anyway?" (you will need a subscription to view). 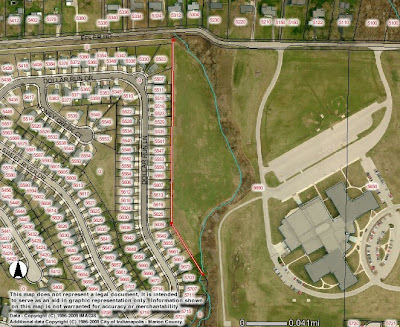 The article centers around a claim by the MSD Decatur Township that it owns land that River Run residents had been told was their common area. Given my role in land use issues here in Decatur Township, Hillenburg asked me about this situation. Information was still evolving in the last few days and even hours before the article went to press. Bottom line - the school district is mistaken when it claims to own this common area. First a little background. The River Run subdivision was zoned and developed by Crossmann Communities. Eventually, the Crossmann company was bought by Beazer Homes. River Run extends from Epler Avenue on the north to Mills Road on the south and from Mann Road on the east to the Old Mill Park subdivision on the west. In 1998, Crossmann and the district did a land swap - 14 acres then owned by Crossmann that had extensive Mann Road frontage was swapped for 14 acres then owned by the district that had frontage on Epler Avenue. This exchange gave the district a second entrance for what became the Decatur Intermediate School, and it gave River Run a wider northern area, more suitable for development. In 1999 these swapped acres were rezoned to the appropriate land use categories through petition 99-Z-32. This was all before Don Stinson became Superintendent. Since then the new acres in River Run were platted and built. Common areas are scattered throughout the development, but the one in question is about 1.5 acres and abuts the southwest corner of the Intermediate School property and is on the north side of the area where Dollar Run Lane, Sweet River Drive and Dollar Forge Lane all converge. The district claims that they own this common area. But, all documents obtained fromt the City differ with that conclusion. Lets start with the Assessor's records. Greg Bowes, Marion County Assessor, tells me that his records show the legal owner to be the River Run Homeowners Association and that the last transaction involving that property was a transfer of ownership from Crossmann Community Partners to the HOA in 2004. I also made inquiries of staff in Division of Planning, Department of Metropolitan Development. One particularly helpful piece of information was provided to me by Linda Ahlbrand, Principal Planner II, who generated a GIS layered map of the area. I have uploaded it to Google Docs (click here to view) and there is a smaller version below. The northern end of the River Run subdivision is shown, along with the school property and some abutting properties. The green shaded area is the common area parcel that is in dispute. The red-striped areas are the two 14-acre parcels that were swapped in 1998 and rezoned in 1999. 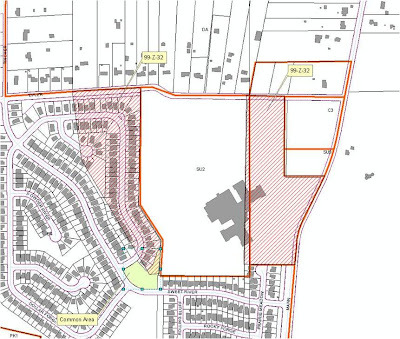 The red-striped areas were generated by the computer, based upon the legal description of the property provided for the rezoning. As you can see, the bulk of the common area was owned by Crossmann even before the land swap. The little spike on the north side of the common area was transferred to Crossmann due to the land swap. At this point it is clear to me that this common area is owned by the River Run HOA and not the school district. If the district continues to make claims on its ownership, then it needs to prove the ascertain. But, I believe they are simply mistaken. [August 31, 2010 - edited to add - in speaking with a neighbor in this area, it is clear that the property being discussed is not this 1.5 acre common area. Rather it is a 5 or more acre area to the north that lies between the homes in River Run and a creek or stream that runs through the school property. Why the school district thinks that this is linked to the land swap is not clear at all, as this property would have been zoned for school use and owned by the district well before, during, and after the swap. In addition, the district could not sell or transfer for free, any property it owned unless two independent appraisals determined its value at zero dollars. It is difficult to imagine that any valid appraisal would determine that a 5 plus acre parcel, with frontage on a busy street, is zero. Nor, it is clear that the district could preselect the buyer of such a property. Below is a map of the area. The 5 acre parcel is the land laying between the homes, which I highlighted with a red line, and the blue line that denotes a stream. The IBJ is on top of it once more. Reporter Scott Olsen is reporting today that the Capital Improvement Board is requesting an increase of $10 million in their 2011 budget over their budget this year. But get this -- it has absolutely nothing to do with their $10 million gift to the Pacers organization ! Quack, quack, quack. The Capital Improvement Board’s 2011 operating budget is projected to increase by $10 million over this year's budget—the same amount the organization initially will provide to the Indiana Pacers under a new funding agreement reached last month. But CIB President Ann Lathrop insists funding for the Pacers to help operate Conseco Fieldhouse, which totals $30 million over the next three years, is not the only reason for the larger, $73.1 million operating budget. Okay, I know I'm not an accountant, but I did major in Math in College, so... If the CIB never gave away the $10 million to the Pacers, and they never agreed to $3.5 million in improvements to the Conseco Fieldhouse, wouldn't the CIB budget drop by $3.5 million in 2011? Higher-than-expected costs to operate Lucas Oil Stadium have helped put the CIB in a financial bind. The 2011 operating budget allocates $3.5 million, the same amount as this year, to the Indianapolis Colts for a share of revenue from stadium events. Another $1.6 million—$100,000 more than this year—will be given to the team to reimburse it for game-day expenses. Other highlights of the 2011 budget include $300,000 in funding for the Arts Council of Indianapolis, which formerly received as much as $1 million annually, and $300,000 to support local tourism efforts. I have uneasy, mixed feelings about Olsen's disclosure that the $8 million of taxpayer money that the CIB would normally hand over to the Indianapolis Convention & Visitors Association, "will not come from CIB revenue but from downtown-development funds". Hold on to your hats, er, wallets, folks. The CIB budget is going up by $10 million AND $8 million will come from 'downtown-development funds'. That adds up to an increase of $18 million for the tourist trade. But, contrary to Lathrop's assertions, I still think $10 million of that is the gift to the Pacers. The Indianapolis Business Journal has an informative article, currently online, about the progress school districts in the 8-county region achieved during 2006-2008. They also relate the information in a map format that is easy to read, and therefore quite informative. Some unsung local school districts are better than the most glamorous districts at improving their students’ academic performance, an IBJ analysis of new figures from the Indiana Department of Education suggests. Franklin Township outshines Hamilton Southeastern. Indianapolis Public Schools upstages Zionsville. To be clear, students in the less affluent districts do not score higher on tests than their counterparts in the prestigious districts. And not even the most enthusiastic supporters of the new “growth model” way of measuring students and schools are prepared to say, for instance, that Warren is necessarily a better district than Carmel. But the 2006-2008 figures, made available to schools in January and the public a few weeks later, show that some districts facing overwhelming odds in the form of poverty and absentee parents are arguably among the best at getting the most from their students. Heikens goes into good detail about the success, as measured in ISTEP score improvement in Warren Township and IPS, as well as looking at Washington Township schools as a high achieving district with lower levels of improvement in scores. This analysis is complex, grouping children by ISTEP scores with other children who obtained the same score throughout the state. They then measured the improvement in test scores of those children as compared with their peers. The analysis pulled together the improvement in ISTEP scores of all children within any school district - compared with how each child's peers fared in other districts throughout the state. So, bottom line, this analysis is presented in a clear fashion, but the analysis underpinning it, is complex and reflects more than the change in average test scores district to district. It is an attempt to hold districts accountable for the advancement of student learning as compared to student learning throughout the state, child by child. The school districts are categorized by the State Department of Education, as High Achieving or Low Achieving, according to the % of students passing ISTEP. They are also categorized as High Growth or Low Growth, according to the improvement in the test scores over the 2006-2008 time frame, using this child by child improvement analysis. While the IBJ lists all school districts in the 8-county region, below I just pulled out the Marion County school district information. But, do look at the map for a broader perspective. The 8-county rank is based on the ISTEP score improvement among the 44 school districts in the region. As the ISTEP data for 2009 and 2010 come out, the DOE will plug those numbers into this student achievement growth model. This is and will continue to be a very interesting approach to analyzing how well school districts are doing at improving the education of their students. Yesterday's Indianapolis Star had public notice of the 2011 budget hearings for Rocky Ripple and Homecroft, as well as the announcement of a preliminary hearing by the Indiana Utility Regulatory Commission on the sale of the water and sewer utilities. Rocky Ripple officials estimate a total budget of $100,707, with an estimated maximum property tax levy of $24,261, down a smidge from this year's $24,443. The will hold a public hearing on September 14 at 7:30 pm at 930 W 54th Street. They expect the Common/Town Council will vote on the budget on October 19. The 2011 budget for Homecroft is estimated to be $239,454, with a maximum levy of $90,000, up from this year's $75,132. The Common/Town Council will hold a public hearing on September 28 at 7:00 pm, at 4925 S Shelby Street (Perry Township Government Building). They expect to adopt the budget on October 26. Both of these budgets will go to the City-County Council for a non-binding review. The Municipal Corporations committee will hold its own public hear on these budgets at their September 28 meeting that begins at 5:30 pm in room 260 of the City-County Building. LEGAL NOTICE OF A PREHEARING CONFERENCE AND PRELIMINARY HEARING INDIANA UTILITY REGULATORY COMMISSION CAUSE NO. 43936 JOINT PETITION OF THE BOARD OF DIRECTORS FOR UTILITIES OF THE DEPARTMENT OF PUBLIC UTILITIES OFTHE CITY OF INDIANAPOLIS, D/B/A CITIZENS ENERGY GROUP, CWA AUTHORITY, INC., THE CITY OF INDIANAPOLIS AND ITS DEPARTMENT OF WATERWORKS AND ITS SANITARY DISTRICT FOR APPROVALS IN CONNECTION WITH THE PROPOSED TRANSFER OF CERTAIN WATER UTILITY ASSETS TO THE BOARD AND THE PROPOSED TRANSFER OF CERTAIN WASTEWATER UTILITY ASSETS TO THE AUTHORITY, INCLUDING: (A) APPROVAL OF INITIAL RATES AND RULE FOR WATER AND WASTEWATER SERVICE, AS WELL AS THE TERMS OF CERTAIN AGREEMENTS FOR WASTEWATER TREATMENT AND DISPOSAL SERVICE; (B) APPROVAL OF AN ENVIRONMENTAL COMPLIANCE PLAN UNDER IND. CODE 8-1-28 AND AN ADJUSTMENT MECHANISM FOR WASTEWATER RATES TO PROVIDE TIMELY RECOVERY OF COSTS NECESSARY TO COMPLY IN WHOLE OR IN PART WITH THE SAFE DRINKING WATER ACT AND/OR CLEAN WATER ACT; (C) APPROVAL OF PROPOSED ALLOCATIONS OF CORPORATE SUPPORT SERVICES COSTS AMONG AFFECTED UTILITIES; (D) APPROVAL OF AN OPERATING AGREEMENT BETWEEN CITIZENS ENERGY GROUP AND CWA AUTHORITY, INC.; (E) APPROVAL OF DEPRECIATION RATES AND OTHER ACCOUNTING MATTERS RELATED TO THE WATER AND ASTEWATER ASSETS; AND (F) ANY OTHER APPROVALS NEEDED IN CONNECTION THEREWITH Notice is hereby given that the Indiana Utility Regulatory Commission will conduct a public Prehearing Conference and Preliminary Hearing in the above-captioned Cause in the IURC Conference Center, Suite 220, Judicial Courtroom Judi cial Courtroom 222 of the PNC Center, 101 W. Washington Street, Indianapolis, Indiana,, commencing at 1:30 PM, EDT, on Monday, September 13, 2010. This hearing is open to the public. If the Prehearing Conference does not result in agreement among the parties acceptable to the Commission concerning all procedural and other preliminary issues which may appropriately be resolved prior to a hearing on the merits of the above-captioned proceeding, evidence may be heard on the above date on all such disputed issues. These procedural and preliminary issues may include but shall not be limited to, the jurisdiction of the Commission over the parties and subject of the proceedings; a representative test year for consideration of the valuation of utility property, operating expenses, and revenues from existing rates; accounting methods, standards and principles to be applicable to these proceedings; need for and time of prefiling testimony; dates and places for hearings on the merits of this proceedings; and issues related to prehearing discovery. Any party who has an interest in or who may be affected by the procedural and other preliminary issues which may be determined in the Prehearing Conference and Preliminary Hearing should participate. All parties will be bound by the procedural and other preliminary finds and determinations made pursuant to agreements or evidence received at the Prehearing Conference and/or Preliminary Hearing held pursuant to this notice. If an accommodation is required to allow an individual with a disability to participate in this meeting, please contact the Office of the Executive Secretary of the IURC at (317) 232-2709 or TDD (317) 232-8556 at least 48 hours before the meeting. Today's Star has several public notices of budget hearings as well. Up are the Beech Grove Schools, Beech Grove Library, and three posts noticing hearings to be held by the City of Indianapolis for Health & Hospitals, IMCPL, and IndyGo budgets. The Beech Grove Schools Corporation estimates a total budget of $29,378,233, with a maximum property tax levy of $14,031,380, up from $9,271,971 this year. The notice also includes their 3 year capital projects plan and bus replacement plan. The Board will hold a public hearing on September 20 at 6:00 pm in the board room of the School Corporation at 5330 Hornet Avenue. They expect to vote on the budget at their October 18 meeting. The Beech Grove Library estimates a total 2011 budget of $1,163,400, with a maximum property tax levy of $1,115,000, down slightly from $1,116,091 this year. They will hold a public hearing on October 14 at 6:00 pm at the Beech Grove Library. They expect the Board will vote on the budget at their October 25 meeting at 4:00 pm. The City-County Council has the statutory responsibility to review and vote on the budgets of all the Municipal Corporations. Public notice of the public hearing before the full Council on September 20 will include the proposed $46,800,000 property tax levy for the Indianapolis-Marion County Public Library, the proposed $26,470,154 levy for IndyGo, and the proposed $102,130,737 levy for the Health & Hospitals Corporation. The Council will vote on all of these budgets and levies at their October 25 meeting. The Municipal Corporations committee will hold its own hearing on these matters on September 27, beginning at 5:30 pm in room 260 of the City-County Building. Today's Indy Star seems to be non-stop pieces on IMPD and how to clean it up. Yes, folks, we are no longer discussing a 'few bad apples', we are now discussing an errant culture. We begin with the front page article by Francesca Jarosz, "Leaders: Change how IMPD operates". In this piece, Jarosz covers a new proposal by Council President, Ryan Vaughn, and Councillor Ben Hunter. Hunter Chairs the Public Safety Committee and is a former IPD officer himself. They have proposed a 10-point plan that they intend to bring to the Council in September. But Vaughn and Hunter say their reforms have less to do with the latest tribulations than a long-standing culture of problems within IMPD. "This is a two-decades-old problem," said Hunter, an 11-year Indianapolis police officer who now leads Butler University's police department. "People have treated the symptom but not the root cause. There needs to be a shift to raise the bar." "Generally speaking, there are a lot of good points in this," Owensby said. "Some may be a little overzealous, but they're on the right track." I have two thoughts tangential to the proposed changes for IMPD being offered by Vaughn and Hunter. 1) They may not realize it, but they are acting as leaders, in the forefront on the IMPD issue, and making Mayor Greg Ballard look weak. It looks for all the world as if Ballard does not have their confidence when it comes to IMPD, or they would have asked him to offer their suggestions as his own. 2) Since it is now clear that there is an issue of an errant culture within IMPD, the public deserves to have an outside team of experts look at the extend of this errant culture and propose changes that come from a broader expertise in such matters. Overall, I am glad that proposals are on the table. But, without full disclosure of what the problems are, it is difficult to know if what is being proposed is a cure or a distraction. In hiring a new public safety director, city officials said they wanted an impartial boss to take on the task of tightening police accountability and restoring public trust. At this early stage, it is clear Straub is trying to fill that role. I don't know if Straub is the 'right guy' or not. But, somebody needs to be able to gain the trust of the public, and that is not happening at this moment. If that somebody is going to tick off the FOP, which Straub is doing quite well, then that somebody must have an even greater amount of public confidence that they are the 'right guy'. At this moment, Straub, with the help of Mayor Ballard, must make the case that he is the 'right guy at the right time', or he will not be able to be effective - no matter what his skills and talents really are. The incident in which officer David Bissard took the life of motorcyclist Eric Wells and critically injured Mary Mills and Kurt Weekly is infuriating, disheartening and inexcusable on every level. Officer Bissard initiated a chain of events that cannot be taken back. There is no excuse for his actions and the tragic consequences that followed. He has caused unthinkable pain to the victims and their families, his own family, and his fellow officers. This is a terrible tragedy for the victims, their families, the citizens of our great city, and the IMPD officers who bravely put on their uniforms every day and dutifully honor the public trust. My responsibility, and the job for the department, is to take steps to make sure this never happens again. All that the Mayor said here rings true. Unfortunately, I seriously doubt it is enough to quell the rising anger. With the motorcycle community coming into Indy from all over the world this weekend for the MotoGP at the Speedway and the the Indy Mile at the Fairgrounds, the Mayor's Letter is timely, but can not match the swelling numbers. From my experience in daily conversations with a certain motorcycle enthusiast to whom I am wed, Bissard's actions are inexcusable AND serve almost as an allegory for life on the road as a motorcyclist. Wells, Mills, and Weekly were stopped when Bissard came tearing down the road. They did exactly what they were supposed to do in staying put. Yet, they were the first to receive the blame of the police and the press. They were the victims in more ways than one. My husband has always told me that the most difficult issue with motorcycle safety is that so many other drivers simply do not see them. For three of their own to be at a complete stop, obeying every law and tactical driving rule, to be killed or seriously injured by a police officer, drunk, behind the wheel, on duty, and then to be blamed for the accident -- well, how could it get any worse? They are all Wells and Mills and Weekly. Just as every African-American is Brandon Johnson. Mayor Ballard is in cyclone here. One of fury at current events of police misconduct and one of fury at a longer term perception of racial bias in the treatment of citizens by the police. This is where leadership is tested. Usually letting heads roll like the Red Queen, will begin to quell anger as it implies that the one in charge sees the exact problem and has an exact, very public, solution to it. But, that is not working in this instance. Now, adding to the cyclone, he has two fellow Republicans, Vaughn and Hunter, who undoubtedly are trying to assist and find a lasting solution, but who in actuality are taking the spotlight and making Ballard look ineffective at a critical moment when he MUST be in charge and absolutely effective. Plus, their proposal and the time it takes to get through the Council, will only serve to make the Mayor look tepid for another two months. Mayor Ballard's military experience was as part of the chain of command - somewhere in the middle to top. Now his role is more like that of the President in regard to the military - the Commander in Chief and civilian. The leadership needed at this level is different. He must be in front of the parade, not somewhere in its midst. He needs to find a way here - and not just for his reelection efforts, but also for the residents, for the officers, and for the reputation of Indianapolis. Public notices for the 2011 budget hearings for three taxing units in Marion County hit the Indy Star today. Decatur Township government is estimating a total budget of $9,186,657, with a maximum property tax levy of $7,160,929, up from $5,474,087 this year. They note that the maximum levy limitation is a total of $4,385,866. The Board will hold a public hearing on October 12 at 5:30 pm at 5410 S. High School Road. They expect to vote on the budget on October 26. The City-County Council will review this budget on September 28, along with all other Township budgets. This will be handled by the Municipal Corporations committee which will begin its meeting at 5:30 pm in room 260 of the City-County Building. The Town of Williams Creek estimates a total 2011 budget of $162,550, and an estimated total property tax levy of $139,050, up from $73,190 this year. The Town Council will hold its public hearing on this budget on September 2 at 7:30 pm at 8210 N College Avenue. They expect to vote on the budget on October 11. Like the Township budgets, this will also be reviewed by the Municipal Corporations committee of the City-County Council at their September 28, meeting. These reviews are non-binding. The Speedway Public Transportation folks estimate a total 2011 budget of $279,445, with an estimated maximum property tax levy of $247,000, up slightly from this year's $236,336. They note that the maximum levy limitation is $245,553. The notice says that the Common/Town Council or Board of Speedway Public Transportation will hold their public hearing on this budget on September 13 at 12:20 pm at 1540 N Lynhurst Drive. They expect to vote on the budget at their September 27 meeting. Looking at the last few budget revenue figures, including funds from State and Federal sources, which of course includes the federal stimulus money that was expected to be temporary, the expected 2011 revenue weighs in at $1.14 billion, compared with $1.26 billion for 2010, $1.23 billion for 2009, and $1.11 billion for 2008. On the spending side, the 2011 budget proposes expenditures of $1.15 billion, down significantly from the $1.22 billion projected for 2010, down slightly from the 2009 actual expenditures of 1.16 billion, and significantly down from 2009 expenditures of $1.22 billion (remember, this was the last year of City payment for expenses that the State now picks up as part of the property tax overhaul). The 2011 budget is proposed to spend almost $14 million more than it takes in. Tax revenues are expected to be down $45 million from 2010. Federal and State grants and taxes are expected to drop by $73 million. Interestingly enough, the 2011 City-County budget calls for an INCREASE in property tax levy, totalling $336 million, up from $324 million this year. Looking at the fund balances (page 11 of the summary), it would appear that the rainy day fund is being tapped to the tune of $18 million, providing most of the extra money to fund the budget shortfall. Only last year, $16 million was put into the rainy day fund to provide just such a cushion. The Indianapolis-Marion County City-County Council will meet tonight, August 23, 2010. This will be the budget kick-off with Mayor Greg Ballard presenting his overview of the 2011 budget for the City and County. The Council agenda is posted here. There will be a great deal of detailed information available to the public on the City's website, most hot links posting after the Mayor's presentation. As of right now, though, there still are links for those who wish to follow along or participate. On the Council's home page, www.indy.gov/council, they have a link to the schedule of committee meetings where individual pieces of the budget will be presented by the head of the particular department or agency, discussed, opened for public comments, and finally, voted upon. The Council Proposals that will contain the introduced budgets are numbered 231, 232, 233, and 234. I will post links to each, once they are activated, in the sidebar for anyone who remains interested or becomes curious. (5) For any other uses that may be permitted under Indiana law. More will be posted here on this parking meter lease once more details are available. Prop 229 is being referred to the Rules Committee of the Council, which has 5 republicans and 3 democrats. The Rules Committee next meets on Monday, August 30, at 5:30 pm in room 260. Is it time for an external review of the culture within IMPD? I throw this out there, because I certain believe it is time to give voice to the idea. When Frank Straub was name Director of Public Safety, I was cautiously optimistic for two reasons. First, it appeared he wanted IMPD to be a data driven organization, which would continue the best point of Scott Newman's term in that position. Second, Staub was an outsider. Why was that important? Because I figured an outsider was the best person to spot misdeeds within IMPD. Over at Advance Indiana, Gary Welsh has brought forward some disturbing characterizations of how Straub operates as Director of Public Safety (see "Straub Draws Ire of IMPD", and "The Straub Meltdown Continues"). I find my reaction to Welsh's posts a bit complicated by my hope that Straub could or would continue Newman's attempts to clean up the department. While the accusations aired on AI clearly paint a picture of more than poor management skills, I also have to wonder why they are coming to light. Is it because Straub's skills are undermining important department esprit de corps, or because Straub is trying to clean up the department, or both? Or, something else altogether? I don't know and I am leaving those questions up in the air. If you remember back a few years, after Scott Newman became Director of Public Safety, there was a string of incidents and revelations involving IMPD officers. That string of incidents and revelations continue under Straub. Narcotics officers were stealing drugs and money from criminals. These officers were tried and convicted. "A few bad apples", we were told. Quite possibly true. Then, there was what seemed like an entire squadron of off-duty officers who were working for a scrap metal operation, Omnisource, including the top cop responsible for inspections who cited a competitor for what may have been illegal activity. The internal investigation ended, but rumors persist of an FBI investigation still ongoing. "Nothing to see here, move along", was sort of the message. The Lincoln Plowman affair, that either has to do with his role as Councillor or IMPD officer, but which led to his resignation from IMPD just as he was about to be fired. For what, we do not yet know. The investigation of Marion County Prosecutor Carl Brizzi, which may not exactly involve IMPD, but does involve the carriage of justice in our County. Like the Plowman affair, still being investigated ever so slowly. There is the use of excessive force that left Brandon Johnson's face as clear testimony. One officer fired over that. Now we have IMPD Officer David Bisard's curious treatment at the scene of an accident that he caused and which left one motorcyclist dead and two others in serious condition. The officers on the scene insist that Bisard did not appear to be drunk, no field sobriety test was done, no blood test was done for two hours, and when it was done, the person drawing the blood was not trained properly for performing that role in a criminal investigation. This blunder, or bungling, or turning a blind eye, or deliberate coverup, has even embarrassed Carl Brizzi to the point he does want it to tarnish his image. Director Straub is calling in the FBI, which is a positive move, but which clearly recognizes that the public will not trust the outcome of any internal investigation. Maybe it is time for an outside review of the culture within IMPD. Not by a committee of local radio talk show hosts, either. But by an outside group who understand how police departments should operate, how they do operate, and how they hide things when they operate beyond the best interests of the public. They should understand the positive role of the 'thin blue line' to camaraderie, but know the signs for when it has morphed into the thick blue wall that only serves to hide an 'anything goes' attitude. They should know how to entice officers to come forward with information about other officers; just like IMPD is trying entice residents to come forward. I'm not saying they will find anything. Maybe all the bad apples are gone. Maybe that's all it ever has been. But, there are just too many incidents and too long a string of disclosures to feel comfortable with that conclusion just looking in at IMPD from the outside. Is it time for an outside investigation of IMPD's culture? Maybe. But, it is certainly time to entertain the idea. Public notices posted in today's Indy Star include three local school districts' and the Town of Williams Creek's 2011 budget. Lawrence Township school district estimates a total budget of $146,080,357, they note the maximum property tax levy would be $54,516,526, up from $42,914,503 this year. The Board will hold a public hearing on August 23 at 6:30 pm at 7601 E. 56th Street. They expect to vote on the budget on September 13. Franklin Township Community school district is estimating its budget will total $94,181,021, with a maximum property tax levy of $46,916,102, up from $33,246,782 this year. Their Board will hold a public hearing also on August 23 at 7:00 pm at 6141 S. Franklin Road. They expect to vote on the budget on September 20. The School Town of Speedway notice shows an estimated budget of $16,023,361, with a maximum property tax levy of $4,526,881, up from $2,202,088 this year. The Board will hold a public hearing on August 24 at 7:30 pm at the district central office. They expect to vote on the budget on September 14. All three school districts' notice includes a 3 year capital project plan and a bus replacement plan that will also be subject of the public hearing. The Town of Williams Creek has posted an estimated total budget for 2011 of $162,550 with a maximum property tax levy of $139,050, up from $73,190 this year. Their Town Council will hold a public hearing on September 2 at 7:30 pm at 8210 N College Avenue. They expect to vote on the budget on October 11. Like all Township government budgets, this one will be reviewed by the Indianapolis Marion County City-County Council and voted on in a non-binding capacity. The Council's Municipal Corporations Committee will hold its public hearing on September 28 at 5:30 pm, in room 260 of the City-County Building. There is that old chestnut, "When you find yourself in a hole, stop digging". It seems the MSD Decatur Township School Board and Superintendent hold to a different adage - "You can't dig a hole deep enough". Last week the annual financial report of the school district was published in the Mooresville-Decatur Times. These reports are required to contain specific information so that the public has an opportunity to follow the broad financial health and expenditures of their local district. For some information, this report covers the last calendar year of 2009, and other information is reported for the last school year, ended June 30, 2010. From that report we can see that the district took in $95 million dollars in revenue during 2009, but spent "only" $83 million. This left a net cash flow of nearly $12 million. If you recall from a post the other day (see "Decatur Superintendent and School Board Abuse the Public Trust" and "More on Decatur's Loan") the District had an outstanding $23 million tax anticipation warrant at the end of 2009. They had been taking out tax anticipation warrants since 2007, but paying only the interest on these loans, according to the Department of Local Government Finance. Each year or thereabouts, they received property tax dollars that should have gone to pay off that year's loan. Instead they spent the money and floated a new loan. During 2009 they received at least $18 million in property tax proceeds. They should have paid off the lion's share of that outstanding tax anticipation warrant. Instead they spent $6 million on other things - and extended the loan into mid-2010. Even at the end of 2009, they had $12 million that could have made a big dent in the tax anticipation warrant. They chose not to pay even half of that loan, when they clearly had the money. They have been consistently spending millions of dollars of money they knew should be used to pay off the outstanding short term loans. What have they been spending all these millions of dollars on? Now we are saddled with a $19 million four-year loan that they "hope to pay off as soon as possible". According to the DLGF, the loan can only be repaid from operating funds now. This means roughly $5 million less each year for teachers and class size will grow once again to satisfy their inability to pay off a loan when it was due. Meanwhile, they gave 5 retiring administrators nearly a million dollars in parting gifts that were not contractual obligations and clearly violated board policy (see "Decatur School Board Pulls Superintendent's Arse Out of the Fire" and "Decatur Administrator Severance Packages in Contradiction of Board Policy"). That's some of the money that should have been used to pay down or off the tax anticipation warrant. Take a look at the supposed administrative cuts. All have been replaced or will soon be. Jeff Baer had his replacement on board in January. Janet Larch has been replaced. Dave Rather, Pat Jones, Gary Pellico, and Candace Baer will all be back under contract after sitting out a month so they don't violate the pension abuse laws. The two assistant principal positions at the High School that were supposedly cut, have been filled by, I am told, two folks without administrative licenses. Maybe Superintendent Stinson doesn't hold that license in as much esteem as the Department of Education. Lisa Cook is back at her old desk in the Central Office. While pretending to cut all of these administrative positions, Stinson is slowly ballooning the numbers back to where they were. These are ongoing expenses that we simply cannot afford. Remember how we needed to cut $9 million from this year's budget? $3 million in a one time move, and $6 million permanent cuts? It would seem that the only significant monetary cuts we have are the 23 teachers who retired. Assuming top of the scale salaries for those teachers, we are looking at roughly $2.5 million savings - nowhere near where we were told we needed to be. Years of spending money that should have paid off debt, pretending to cut administrator positions, lavishing more money on supposedly retiring administrators, filling all of those positions yet again and ballooning our budget once again - dig that hole, dig that hole, dig that hole. The folks running MSD Decatur Township are more than reckless. And, we are left holding the bag. The Friends of Bel-Aire Park will hold its annual fundraiser on Saturday, August 21 from 11 am to 7 pm. They will have their usual Gospelfest, Classic Car Show, and Chili Cookoff. This year they are adding a Craft Fair. A small $5 per person donation is requested upon entrance; 12 and under are admitted free. This is a really fun event and a way to support a wonderful neighborhood park. All proceeds go to improvements in the park. The MSD Decatur School Board holds is regular meeting tomorrow evening, beginning at 7:00 pm. Prior to that will be an executive session beginning at 5:30 pm. They will hold a public hearing on the budget at the very beginning of their regular meeting. Any member of the public may comment upon any aspect of the budget. The outrageously inadequate agenda is posted here. To see what a real agenda looks like, I will send you to Perry Township School Board's website posting - just click here. The most recent meeting was a special session to ratify the teacher contract. If you click on 'Aug 16 special meeting' you will get access to a review of that contract and everything. The last regular meeting of the Perry School Board was on August 9. To access it, click on the "2010" bar under Active Meetings. All topics will appear in the left panel. Clicking on any topic will display more information than you'll ever get from Decatur's Board. Take, for instance, 'personnel report'. You can actually view that entire report. I requested the 'staff report' from the Decatur School Board's July 23 meeting on July 30 and still haven't received it. They don't want you to know what is going on and what is being decided at the Decatur meetings. And, even after the fact, they do their darnedest to keep the information away from the public. Meanwhile, other School Boards are operating with all due respect for their communities. Today's Indianapolis Star has public notice of two budget estimates. Warren Township posts an estimated budget of $1,752,822, and an estimated maximum property tax levy of $250,000, down from this year's $276,097. The Board will hold a public hearing on September 14 at 5:30 pm at 501 North Post Road. They are expected to vote on the budget on October 26. The City-County Council's Municipal Corporations Committee will hold a non-binding review of all Township budgets, including this one, on September 28 at 5:30 pm, in room 260 of the City-County Building. The IndyGo estimated 2011 budget amounts to $64,859,100 and they estimate a maximum property tax levy of $25,470,154, up from this year's $20,668,415. They note also that the maximum levy limitation is (only) $21,000,000. the IndyGo Board will hold a public hearing on the budget August 19 at 5:00 pm at 1501 W. Washington Street. The Board is expected to vote on the budget on August 30. The City-County Council's Municipal Corporations Committee will review this budget on September 27, beginning at 5:30 pm, in room 260 of the City-County Building. The full Council will hold a public hearing on all budget matters, including this one, at its September 20 meeting. Today's Indianapolis Star has lots of public notices for local school districts as well as a notice related to the sale of the Indianapolis water and sewer utilities. The annual financial reports for IPS, Lawrence, and Beech Grove school districts are up. I cannot overstate the amount of useful information included in these reports. They include information on the number and salary range of administrators, non-certified staff salary ranges, teacher salaries plus extra-curricular compensation, a comparison of the budgeted expenses and how much was actually spent, tax rates for 2009 and 2010, a list of all vendors who were paid over $2500, a list of debt, budgeted vs. actual revenues, and school enrollment by grade level. MSD Pike Township has its notice of tax levies for the upcoming budget process. With an estimated 2011 budget of $132,450,982, they expect a maximum property tax levy of $40,049,800, little changed from $40,050,402 this year. Also noticed are the 3-year capital projects fund plan and bus replacement plan. A public hearing on all will be held August 26, 2010 at 7:00 pm in the Board Room, ASC - no street address given. The Board is expected to vote on the budget at its September 16 meeting. I recently posted about the Decatur School District flopping a 2009 Tax Anticipation Warrant into a 4-year loan (see "Decatur Superintendent and School Board Abuse Public Trust"). I have been contacting various state agencies about this issue and have received some information that contains some good news and some 'Alice in Wonderland' news. The school borrowed $23 million from a private bank in 2007 in temporary loans. Instead of paying down this loan when they received tax distributions in 2007, 2008 and 2009 – they simply made payments on the loan interest. The school is now attempting to pay this loan off as quickly as possible over the next few years. The loan has not been converted to debt service debt but remains a temporary loan. Only the interest on the loan is included in the debt service fund, which is typical of all temporary loans. Keep in mind that the temp loans (with exception of interest) are being paid back within the limitations of the school “normal – maximum and cap rate” levies. This debt – both the temp loan and interest – will not be treated similar to a referendum. An approved referendum project or tax levy would be outside of the circuit breaker caps. This debt – as it was not approved in a referendum vote – is still subject to the circuit breaker cap limitations. The good news part, obviously, is that only the interest on the loan, 2.5%, can be paid from debt service, which is funded entirely from property taxes. The bad news is that Superintendent Don Stinson and the entire School Board, Dale Henson, Don Huffman, Doug Greenwald, Judy Collins and Cathy Wiseman, HAVEN'T PAID THIS BILL FOR 3 YEARS and are hoping to do so within the next 4. These guys have been spending like sailors in port, and back when economic times were great they couldn't even pay off a tax anticipation warrant when it was due. Now, with the economy in the worst recession since the Great Depression, the chickens have come home to roost. They have no one to blame except themselves. I was kicking the tires on the City's new contract database, when I stumbled upon a curious contract between Indianapolis Downtown Inc. and the Department of Public Works in 2009. For those unfamiliar with this new feature of City government, it has a copy of every contract with a City or County department, going back a couple of years. You can access the database by clicking here and typing the word "public" in the password field and click "login". The search dialog box will pop up. To play along at home with this IDI contract, you can enter "5955" in both of the boxes to the right of "contract number". If you haven't used this site before, you will have to download some software in order to view the contract. In 2009, IDI landed a contract for $120,000 from Indianapolis Department of Public Works. The contract is for "Consulting Services" (with 3 pages of specific action items) and the agreement declares that the term shall be from January 1, 2009 through December 31, 2009. The total amount was not to exceed $120,000, which was to be paid out in 12 equal installments of $10,000.00 "after receiving appropriate invoice and status report". To get quickly to the good part, those playing along at home should take a look at page 9, which has all the signatures. What caught my eye were the dates -- Dave Sherman, Director of DPW, signed the contract and the Board of Public Works authorized it, both on November 11, 2009, and Tamara Zahn, President of IDI, signed November 9th, 2009. With less than 2 months to go in 2009, a contract was inked down for the entire calendar year. So, you know I filed an open records request to see all of the supporting documents and invoices. One invoice, only, was submitted for $120,000, dated November 13, 2009, which was approved for payment six days later. Provided to me also, were 12 'Activity Report's, one for each month, including one for November and December, neither of which could not have been completed before payment was asked for and received. These activity reports are not limited to those items performed to fulfill the contract. They include attendance, presumably by anyone associated with IDI, at any meeting - neighborhood, board, committee, or legislative hearing. It includes work done by subcontractors; mentioning every time a planter was planted, weeded, or inspected for insects and plant diseases. It includes preparation for the IDI board meeting and going to said board meeting. It includes calls made to code enforcement, DPW, or parks to attend to some matter discovered by someone at IDI, or their subcontractors. The reports list the bike patrols and meetings with public safety officials. It even lists time spent on crafting and submitting an application for a 2010 crime prevention grant (which they ultimated obtained). etc. etc. etc. a. Department of Metropolitan Development: Attended commission meeting. i. Met with K. Walker, M. Williams and D. Fishel for bimonthly update. c. Indianapolis Local Public Initiative Bond Bank: Attended board meeting. d. IndyParks: Attended board meeting. a. Department of Metropolitan Development: Compiled and provided completed projects report from 2002-1st quarter 2009 to J. Byrnes. b. Department of Public Works: Met with M. Williams and D. Fishel to update contract activities and payment. c. Indianapolis Local Public Initiative Bond Bank: Attended monthly board meeting. ii. Provided Downtown Economic Indicators to K. Taylor. iii. Oriented J. Goss, board representative. a. Presented 2008 Economic Indicators to City-County Council Economic Development Committee. b. Addressed Dept. of Public Works and Parks contracts and funding. c. Attended Indianapolis Local Public Initiative Bond Bank board meeting. a. Received signed 2009 DMID contract and purchase order. b. Attended Bond Bank and IndyParks board meetings. c. Met with D. Reynolds, Controller. a. DPW: Reviewed proposed reduction in current contract. b. Indy Parks: Met with L. Purcel and P. Pinko. a. Resolved contract status with Mayor’s Office. b. Attended Metropolitan Development Commission meetings. d. Provided contract information. Discussed 2010 replacement funding with Mayor’s Office. a. Attended DPW and Bond Bank board meeting. b. Met with Mayor Ballard and P. Okeson to discuss 2010 funding. a. Attended Department of Public Works board meeting. b. Attended Indianapolis Local Public Improvement Bond Bank board meeting. a. Department of Public Works (DPW): Attended board meeting to support approval of revised 2009 contract. i. Provided market information to D. Requiz. c. Met with D. Wu, Mayor’s Office, to discuss Downtown issues and opportunities. Attended Indianapolis Local Public Initiative Bond Bank board meeting. Oriented B. House, new IDI board member, representing Bond Bank. There is no mention of any other contracts between the City and IDI for 2009 in the City's new database except for the contract discussed here and one for $142,144 with DMD (Department of Metropolitan Development). That one was signed by IDI's President, Tamara Zahn, in January, by DMD Director, Maury Plambeck, in March, and by City Controller, David Reynolds, in April. The June entry "DMID" could be a simple typo. I could not find any mention of the Indianapolis Bond Bank at all in the contract database, so it is possible that IDI had a contract with them during the year. IDI certainly seemed to spend a bit of time with Bond Bank personnel and attending their board meetings. But the most interesting of this discussion thread in IDI's activity reports, is the contact with the Mayor's office regarding an apparent reduction in IDI's expected proceeds from it 2009 contract with DPW, and its efforts to secure funding in 2010. Reading between the lines, one could conclude there was a good little tussle going on in City government over taxpayer subsidies for IDI. The very fact that 2009 IDI/DPW contract wasn't signed until November, with payment issued shortly thereafter and not in accord with the schedule put forth by the contract, says that the contract was nothing more than a ruse to funnel taxpayer money to IDI. The least they could do, though, is not make it so obvious. The MSD Washington Township public notice regarding its upcoming budget hearing is in today's Indy Star. With an estimated total budget of $120,967,939, they expect a maximum property tax levy of $61,019,760, up from $28,439,655 this year. They will hold a public hearing on the budget at 7:00 pm, August 25, at the H. Dean Evans Comm. Center, 8550 Woodfield Crossing Blvd. They expect the school board to vote on the budget on September 7. The notice also includes a capital projects plan and a bus replacement plan. Well, I am certainly hearing about the new MSD Decatur Township transportation system. If you have a story you want to share, feel free. It can be a good story, too. Months ago the Decatur bus drivers told the Administration that this new system had been tried in Perry Township where it didn't work. Hmmm.... The central office wasn't listening. The Capital Improvement Board has operated parking lots on the site of the old Market Square Arena ever since that structure was torn down and replaced by the Conseco Fieldhouse a few blocks away. The lots have never been paved, contrary to City Ordinance. The CIB has been operating legally, since it has sought and received a number of consecutive extensions on a variance that allows these two lots to remain unpaved. Well the variance ran out last Friday. A bit belatedly, the CIB has filed yet again to extend the variance until May 1, 2011. They continue to operate while 'between variances'. Not exactly legal, but code enforcement won't touch them as long as a variance has been applied for. The petition number is 2010-MO1-002 and it is scheduled to be heard by the BZA on September 7, 2010. Today's Mooresville-Decatur Times has the annual financial report for both the Decatur and Mooresville school districts. You might want to pick one up as these reports have a lot of information about the finances for the past school year. They include information on the number and salary range of administrators, non-certified staff salary ranges, teacher salaries plus extra-curricular compensation, a comparison of the budgeted expenses and how much was actually spent, tax rates for 2009 and 2010, a list of all vendors who were paid over $2500, a list of debt, budgeted vs. actual revenues, and school enrollment by grade level. Today's Indianapolis Star has public notices regarding 4 area school districts. The annual financial report for Perry and Pike are up. These reports are a treasure trove of information. They include information for 2009-2010; the number and salary range of administrators, non-certified staff salary ranges, teacher salaries plus extra-curricular compensation, a comparison of the budgeted expenses and how much was actually spent, tax rates for 2009 and 2010, a list of all vendors who were paid over $2500, a list of debt, budgeted vs. actual revenues, and school enrollment by grade level. There are also public notices of expected budgets and tax levies for Lawrence and Speedway school districts. Both also have their three year capital projects plan and their bus replacement plans. The notice for MSD Lawrence Township, unfortunately, omitted the totals for expected budget. I added them up for myself, therefore. With an expected budget of $146,080,357, they note the maximum property tax levy would be $54,516,526, up from $42,914,503 this year. The School Town of Speedway notice shows an estimated budget of $16,023,361, with a maximum property tax levy of $4,526,881, up from $2,202,088 this year. Last week I posted "Decatur School Board Pulls Superintendent's Arse Out of Fire", where I spoke specifically about the school board recklessly approving the sumptuous parting gifts that Superintendent Don Stinson handed out to retiring Administrators. Those golden parachutes were granted without prior board approval, against standing board policy, not required by any contractual obligations, and totaled over $800,000 plus an ongoing $100,000 in annual health insurance payments. The board recklessly supported Stinson's spending spree nearly one month after 3 of the 5 had already taken the cash and gone. In that entry, I mentioned that this was the second time in July that the Board had approved action taken by Stinson without prior board approval - which is required as Stinson does not have the authority to approve finances, that lies with the Board as granted by state law. The first time in July was even more egregious than the $800,000 in parting gifts divvied up between 5 people. The short story is that on July 13, 2010, the Board approved Stinson's unilateral action to flop a tax anticipation warrant (often called a 'temporary loan' in Decatur's school district) into a four year loan. But, there is so much more to it than first appears. A little background. Let's take a couple of minutes to talk about property taxes and the route that the money takes from your pocket to the school district and other governmental units in Marion County. Every year during budget season, each taxing unit sets their budget and figures out how much property tax revenue they need to fund that budget. The tax rate is calculated from the total amount of property tax revenue required, divided by the total value of all property in the school district (called the 'assessed value'). The County Treasurer sends out a bill twice a year to collect these property taxes. Once the money is collected, the County Auditor mails a check to the school district for their portion. The school district then can spend that money. The last few years have been unusual in that Governor Daniels ordered Marion County, among other counties, to do its determination of the 'assessed values' all over again. This took time. The delay in determining the assessed value caused a delay in determining the tax rate which caused a delay in sending out the property tax bills, which caused a delay in paying the property tax bills, which caused a delay in sending the property tax revenues to the school district. But the school districts, and other taxing units, still had to pay for their operations during the delay. So, they got short term loans called 'tax anticipation warrants', which this district often calls 'temporary loans'. The school district would eventually receive the property tax money; they would just receive it about one year late. The TAW would be repaid once the County Auditor sent the property tax check to the district. It is kind of like a payday loan. As soon as you get your paycheck, you are supposed to go in and pay off your loan. The public has a right to assume that a 'tax anticipation warrant' will be paid off as soon as the tax money has been received. "Dr. Baer asked permission to begin the process for pursuing temporary loans in the amount of $23,000,000 for 2009. He explained that because of the status of the state budget and the fact there has been no collection of property taxes it has become necessary to borrow against local tax monies. At present, the school corporation is not scheduled to receive any property tax money until June of 2009. Mr. Huffman moved that the Board approve begin the process of pursuing temporary loans for 2009. Mrs. Wiseman seconded the motion. The motion carried unanimously." It is questionable whether the district should ever have taken such a large loan or TAW, since the State Department of Local Government Finance only authorized them raise $18 million from property taxes in 2009. There is still an outstanding issue here on the $23 million, but it is not the main point of this blog entry. On January 13, 2009, the TAW was finalized and the $23 million was received by the District. In June, half of the $18 million authorized for property taxes would have been sent to the school district by the County Auditor, and the rest sent in December. So, by the end of 2009, the district had $18 million in order to pay back the TAW. They should have paid it back then. "Dr. Baer presented a Resolution for a Tax Anticipation Warrant Rollover to 2010. He explained this was the same process used in 2008 and this would allow repayment of debt to be carried over to the end of June 2010. Mrs. Wiseman made a motion to approve the Resolution. Mrs. Collins seconded the motion. The motion carried unanimously." "...on June 30,2010, the School Corporation executed and delivered to Regions Bank, ...documents evidencing the extension of the final maturity of the Obligations to February 15, 2014..., and [Regions] has accepted the Extension." The School Corporation did not have the authority to give such "documents evidencing the extension" because there had not been any Board action to create such documents. Again, Don Stinson acted unilaterally, usurping the authority of the Board... and the Board again pulled his arse out of the fire. What does all this mean to the taxpayers? This means that the school district should have paid off the 2009 TAW with the property taxes paid by residents in 2009. Instead, Stinson and the Board will make you pay even more taxes to pay off the new 4-year loan. YOU ALREADY PAID THE TAXES, but you will have to pay them a second time. The public has a right to assume that a 'tax anticipation warrant' will be paid off as soon as the tax money has been received. The public trust should not be abused by keeping the money and floating another loan to pay off the first one and then foisting the tab for the new loan onto the backs of the taxpaying public. Its called "robbing Peter to pay Paul". Where has the money gone? $18-23 million is very serious money. Where has it all gone? In the end, it is also a devious and underhanded way to get the Decatur Taxpayer to pay more money to the district without ever having had a say. There was never a public hearing, the public notice was uninformative, and there has not been a referendum to increase our property taxes over the next 4 years. Roughly $5 million more money will have to be raised EACH YEAR, which will cause a roughly 25% increase in school taxes. No vote. No hearing. No say. The school board, Dale Henson, Don Huffman, Doug Greenwald, Judy Collins and Cathy Wiseman, have allowed our school finances to go from really bad to unsustainable. They are allowing Don Stinson to raise cash by not paying off our loans, when the money was available to pay off those loans. We are now in hock twice for the same money. This is reckless. And to approve this fiscal disaster two weeks after Stinson usurped their authority, is to have totally abandoned all responsibilities that they have as elected officials to serve the public interest. Stinson and the Board were reckless in getting a $23 million TAW, when $18 million was all the State of Indiana authorized them to raise in property taxes for that year. Stinson and the Board were reckless in not paying off that TAW in June of 2009 or January of 2010, when they had the money from the taxpayers to do so. Stinson and the Board were reckless to turn that 2009 TAW into a four year loan, making the taxpayers pay yet again for loan. This last point is where they have totally abandoned the voting public; they made a grab for more money and hoped the public would not notice that they never had a say on whether or not they wanted to give the district more money. Stinson and the Board have acted without honor. They have abused the public trust. The required public notice for the MSD Decatur Township estimated budget and property tax levy has been published in the Mooresville-Decatur Times. Those of you who are interested in looking at the details will need to get out to the convenience or grocery stores to buy a copy today, as the Times comes out with a new edition tomorrow. With an estimated budget for 2011 of $67,753,265, they list a maximum property tax levy of $26,786,842, up from $19,475,910 for this year. The Board will hold a public hearing at 7:00 pm, August 17, 2010, at the Central Office, 5275 Kentucky Avenue. They expect the Board to adopt the budget on September 14. Also listed are the actual tax collections for 2007 through this year, the proposed three year plan for the Capital Projects Fund, and the bus replacement plan through 2022. They note that they will be leasing 3 additional buses for 2011. Today's Indy Star has the Annual Financial Report for the MSD Warren Township school district. These reports contain information for 2009-2010; the number and salary range of administrators, non-certified staff salary ranges, teacher salaries plus extra-curricular compensation, a comparison of the budgeted expenses and how much was actually spent, tax rates for 2009 and 2010, a list of all vendors who were paid over $2500, a list of debt, budgeted vs. actual revenues, and school enrollment by grade level. IPS has public notice of its 2011 budget, the taxes collected from 2007 through 2010, and their bus replacement plan through 2022. For the 2011 budget they are estimating a total of $509,638,000 with an estimated property tax levy of $142,414,000, up from $120,232,632 for this year. The School Board will hold a public hearing on the budget at 7:00 pm, August 16,2010, at 120 E. Walnut Street. The Board is expected to vote on the budget at their August 26 meeting. Marion County Health & Hospitals has the 2nd publication of its estimated 2011 budget and property tax levy. From a total estimated budget of $392,920,679, they estimate a tax levy of $102,130,737, down slightly from $102,678,763. Their budget hearing is set for 1:30 pm, August 10, 2010, at Wishard, 1001 W. 10th Street. They expect to vote on the budget at their August 31st meeting. The Indianapolis Marion County Public Library has notice of its 2011 estimated budget and property tax levy, as well. From a total estimated budget of $53,500,000, they estimate a $46,800,000 property tax levy, up from $37,474,023. The notice also notes that the 2011 estimated maximum levy limitation to be $39,500,000 - so this is more likely the end point for the budgeted levy. Their Board will take public comments on the budget at 6:30 pm, August 19, 2010, at the Central Library, 40 E. St. Clair Street. They expect to vote on the budget at their August 30, 2010, meeting at 5:00 pm. Today's Indy Star has a correction to the MSD Wayne Township Annual Financial Report previously published. Corrected are data listed in the comparison of approved vs. actual expenditures for 2009. Also posted in the public notice section is the Annual Financial Report for Carmel Clay Schools. Nearly one month after 3 Administrators retired from the MSD Decatur Township school district with wads of cash, extra years of service purchased from the State Teacher Retirement Fund, and a promise of paid health insurance until Medicare picks them up - all clearly prohibited by School Board policy and not a part of any contract - the School Board ratified the unilateral action by Superintendent, Don Stinson. Remember these names -- Dale Henson, Don Huffman, Doug Greenwald, Judy Collins, and Cathy Wiseman. I have called them a rubber stamping school board numerous times. But, to continue to do so is to do a disservice to rubber stamping school boards everywhere. They are eyeball deep in fiscal recklessness that makes their past behavior pale in comparison and should make every taxpayer in Decatur Township extremely nervous. Dale Henson, Don Huffman, Doug Greenwald, Judy Collins, and Cathy Wiseman are now equal players with Don Stinson in running our school district into the ground. For the second time this month, the school board has unanimously approved unilateral action taken by the Superintendent without prior board approval. For the second time this month, the school board has unanimously thrown fiscal responsibility out the window, making the fiscal morass we are in far far worse than even I imagined it could or would be. For this post I will discuss the action taken last Thursday, July 29, 2010, at a special meeting of the Board. Just as I speculated (see "Suddenly - Decatur School Board Calls Special Session"), the purpose of that meeting was to legalize the retirement packages given by Don Stinson to retiring Administrators Jeff Baer, Dave Rather, Pat Jones, Gary Pellico, and Janet Larch. I have already shared with you the retirement package information (see "Decatur Administrator Severance Packages Really Sweet") that amounted to over $800,000 this year and, additionally, up to $100,000 in coming years for ongoing health insurance costs. I also shared with you the 2004 Board policy that specifically banned this type of retirement package (see "Decatur Administrator Severance Packages in Contradiction of School Board Policy"). This was part of a statewide effort to become more fiscally responsible and buy out the retirement promises made in contracts, but for which no money had been set aside. It cost Decatur taxpayers at least $8 million to buy out these unfunded liabilities. But, Don Stinson gave his retiring pals some great parting gifts anyway. And the school board unanimously pulled his arse out of the fire, tossed the taxpayers arses into the fire, and approved these retirement packages - EVEN THOUGH 3 of the 5 LEFT THE DISTRICT nearly a MONTH before. The agenda for Thursday's meeting simply said "Staff Report". Surprise Decatur. Not only did they approve Stinson's unilateral action, they increased the severance package for Jeff Baer by $1000, and for Gary Pellico by a whopping $22,030.66. Nice job Dale Henson, Don Huffman, Doug Greenwald, Judy Collins, and Cathy Wiseman. We can't afford to keep Lynwood open as an elementary school, thereby increasing class sizes, but we can give these 5 people over $800,000 as a parting gift -- on top of the contract buyouts we paid for in 2004-2005 -- on top of the money we have been putting into the Indiana State Teacher Retirement Fund for them every year since -- on top of the money we have put into three other retirement funds for each of them every year since -- and which was rightly banned by School Board policy and which was not a contractual obligation. Remember this Decatur taxpayers. Remember this Decatur parents. Remember these names: Dale Henson, Don Huffman, Doug Greenwald, Judy Collins, Cathy Wiseman, and Don Stinson. The public notices in today's Indy Star include the Annual Financial Report for the Speedway school district. This notice includes tons of information - covering 2009, the number and salary range of administrators, non-certified staff salary ranges, teacher salaries plus extra-curricular compensation, a comparison of the budgeted expenses and how much was actually spent, tax rates for 2009 and 2010, a list of all vendors who were paid over $2500, a list of debt, budgeted vs. actual revenues, and school enrollment by grade level.